SALEM — The walk began in fog, winding along 25 miles of roadway leading from St. Joseph Parish here to the Brigittine monastery in Amity. By the afternoon, the fog and clouds gave way to clear skies. 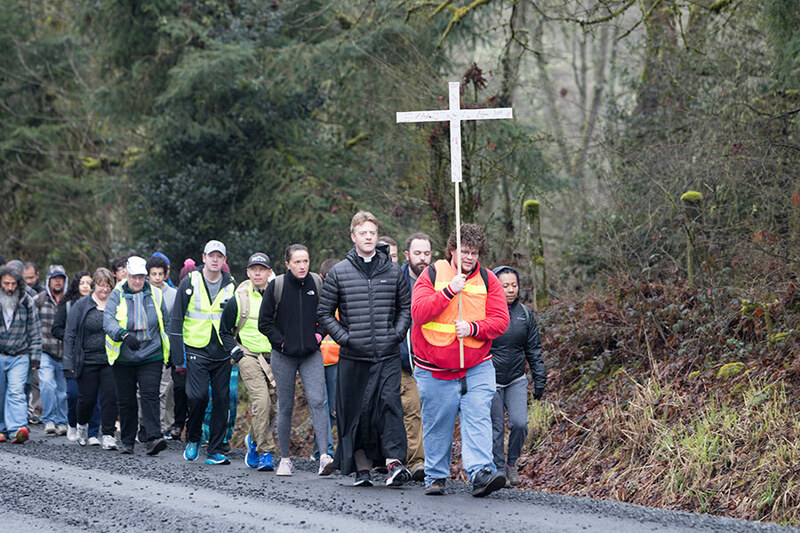 Nearly 80 pilgrims, including men, women and children, participated in the March 9 “Ashes to Ashes” Lenten walk through the Willamette Valley’s forests, orchards and farms leading to the Priory of Our Lady of Consolation. Pilgrims walked from dawn to dusk, ending at the monastery for the evening vespers service. The idea came to Father Jonah Lynch, parochial vicar of St. Joseph, when someone approached him about making a pilgrimage to Mexico. The priest, who has spent much of the time since he was ordained in Rome, thought back to a nighttime pilgrimage he made in Italy. “It’s different enough to be interesting but also doable in a regular weekend,” said Father Lynch. The first pilgrimage walk, which drew a crowd of 125 pilgrims, was held in November, going from St. Joseph Church to Mount Angel Abbey. After the pilgrims reached Mount Angel, they left cards with prayer intentions with the Benedictine monks there. On his most recent trip to the abbey, Father Lynch noticed that the cards were still there. But the fruit did not stop there. There’s “also just a very simple but powerful fact of biting off a little more than you can chew and having to trust in God,” added Father Lynch. “In the moment, I didn’t really take what we’d think of as pleasure in the pilgrimage,” said Andrew Pearson, a junior at Willamette University in Salem and a member of St. Joseph Parish. The walk was trying and wasn’t what the college student imagined it would be. “I was looking for some kind of special spiritual feeling to wash over me. I was praying and walking as others might do yoga, looking for a spiritual high that never came,” said Pearson, who walked with around a half dozen other students from the Newman Club at Willamette. When time came to place his prayer intentions before Our Lady of Consolation at the Brigittine monastery, he was given immediate insight. “I think it was given to me by Our Lady for the offering that I made of the Lenten and prayer requests at the end,” said Pearson, adding he was glad he made the journey. Steve Vandecoevering, a member of St. Joseph Parish, volunteered to support the pilgrimage with wife Gianna. The couple helped transport supplies and pick up tired or injured walkers along the way. One of the pair would walk while the other would drive the church bus. “It was interesting to see the surroundings in a new way — areas I’d driven through but never taken the time to really see,” he said. Vandecoevering walked about 10 of the 25 miles, though he jokes he tried to make up for not walking the full way by carrying his toddler on his back. For Vandecoevering, connecting with other pilgrims was powerful. He points to a conversation he had with a younger man trying to discern his path and the people he was able to drive in the bus. “There were people I didn’t even talk to a lot but felt connected to just because I was transporting them,” said Vandecoevering, adding that walking in the pilgrimage brought about a deeper connection. Plus, even walking 10 miles was enough to make Vandecoevering a little sore over the next couple of days.